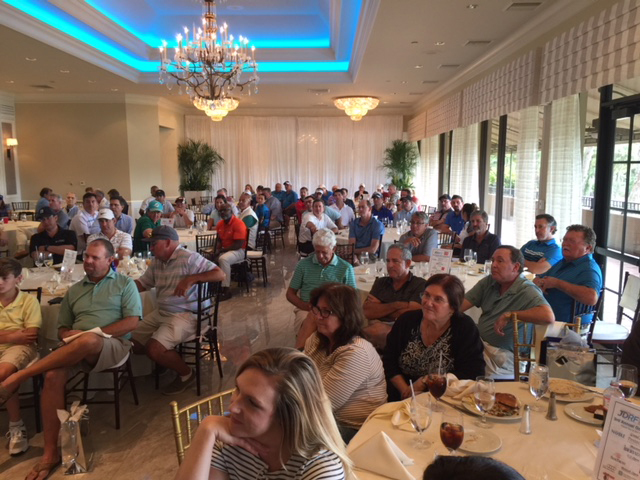 We had a great day of golf on Friday with 124 golfers. 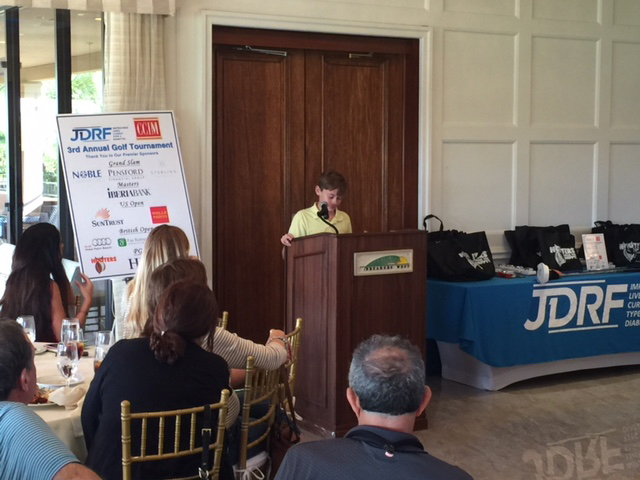 Here are a few pictures of the event including 12 year old Zach who talked about being diagnosed with Type One Diabetes a year ago. I also include a frame worthy picture of me with your hole sign. 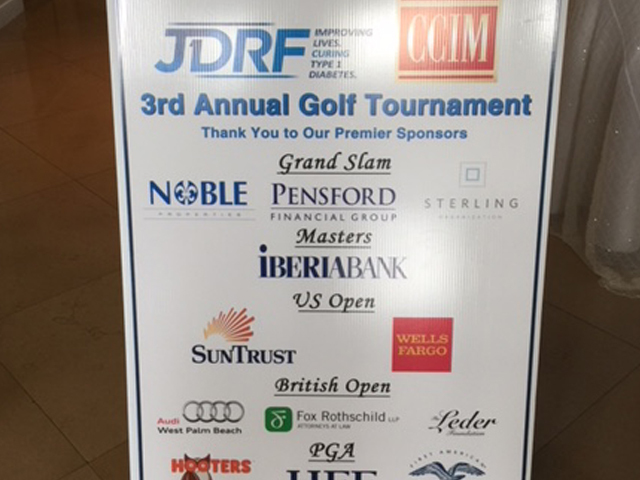 We won’t have the final numbers till next week but I think we raised about $65,000 for JDRF which is 20% more than last year. Thank you so much for your support. Next year you have to come for the golf and luncheon. So many amazing raffles and silent auction items!!! A self-described Army brat, Walter B. Duke III was born on New Year’s Day at Walter Reed Army Hospital in Washington, D.C. For the first six years of his life, Walter’s Army-pilot father was stationed at various bases around the globe and so the family traveled with him wherever he was sent. When his father went to serve in the Vietnam war, Walter’s mother moved the family to Fort Lauderdale to be close to her parents who had lived in the area since 1956. Walter grew up the South Florida way, on the water, fishing and boating with two uncles and an aunt who loved salt water fishing in the Atlantic and fresh water fishing in the Everglades and Chokoloskee. When his father returned from the war he became a commercial airline pilot and moved the family to nearby Hollywood, where they planted roots and became fixtures in the community. Mr. Duke was a major figure in little league and the youth sports scene in Hollywood, where he has a baseball field named after him at Rotary Park. Walter credits his father with teaching him the value of volunteering, teamwork, and leadership skills through his involvement in sports, and thanks his aunt and uncles for helping him to become a true steward of the marine industry. In the aftermath of Hurricane Irma, the clean-up and rebuilding aren’t the only fallout that Florida must deal with. 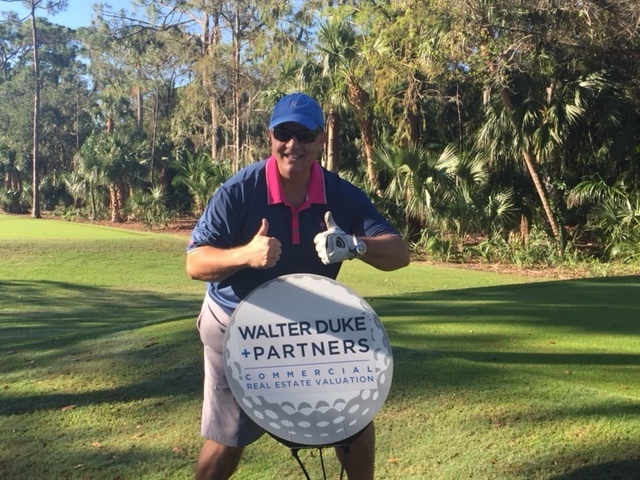 Walter Duke + Partners has survived four catastrophic hurricanes since 1975. Based on our recent and historical experience, below are five ways we see Irma impacting Florida real estate values. The cost of labor and materials will rise dramatically post-storm putting pressure on already skinny development budgets. In the aftermath of Andrew in 1992, it was common to see construction costs rise as much 30% to 40%. The situation is compounded by the massive rebuilding efforts in Houston in the aftermath of Hurricane Harvey. Contractors may directly elect to walk away from the job rather than face huge losses leaving developers in a pinch. Residential condo developers may decide to table projects due to lack of feasibility in the face of rising costs, growing inventories and declining sales. South Florida cities have been implementing adaptive measures to combat sea level rise. So far, the business community has been late to the game but in the wake of Irma and Harvey that will likely change. Look for both the trade and public sectors to further address sea level rise and work with the insurance industry to demand more resilient developments and communities. These storms also lent credence to tougher building codes, because guess what? They worked and saved life and property. One of the early beneficiaries of Hurricane Harvey in Houston is the self-storage sector. The Wall Street Journal reports a surge in demand for self-storage space in the Houston market since the storm. Before Harvey, self-storage companies had been in aggressive price competition, with incentives such as free rent commonplace. We expect to see this in South Florida where there has been a widespread development of self-storage facilities as well, but landlords will be mindful of not being perceived as price gougers. 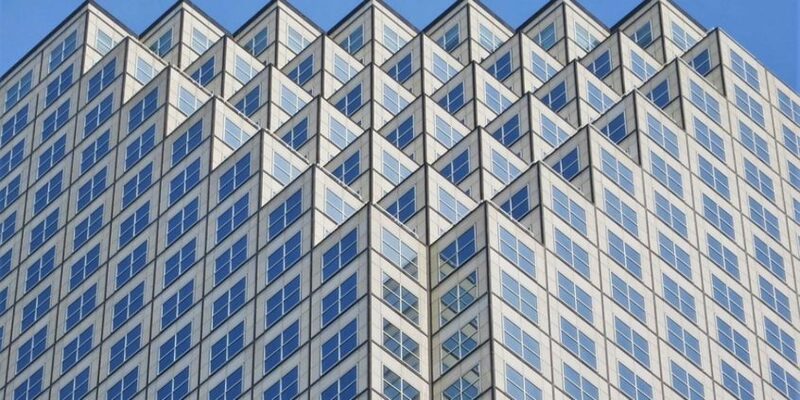 The need for temporary office space will also tighten up an already tight South Florida office market. Values for these property types should continue to trend upward. 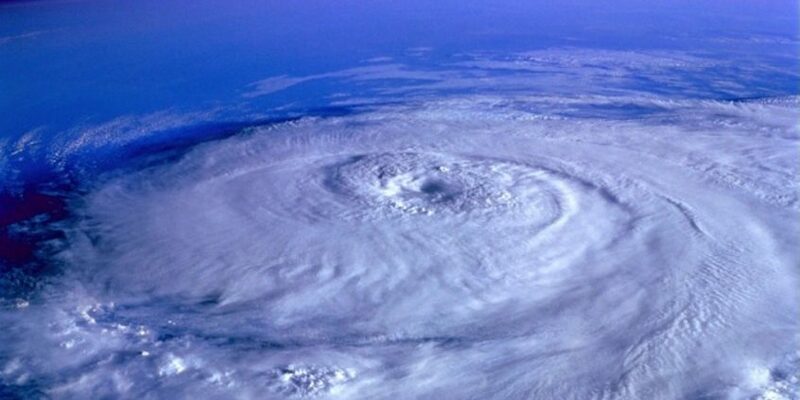 Companies and developers will be more mindful of the importance of hardened buildings and backup systems as everyone seeks to minimize the down time after a major storm. Add to that the increasing likelihood of a terrorist attack, and we think you will see increased demand and value of disaster-proof structures. Insurance costs for commercial real estate have been declining steadily since the beginning of the current economic recovery in 2012. They are currently the lowest they have been in years. If history is any indicator, that is about to change. Look for insurance costs on commercial real estate to double over the next five years. This will dramatically negatively impact loan proceeds and size due to much less net operating income. In short, values are likely to decline, especially in properties such as multi-family where the landlord bears most of the expenses. 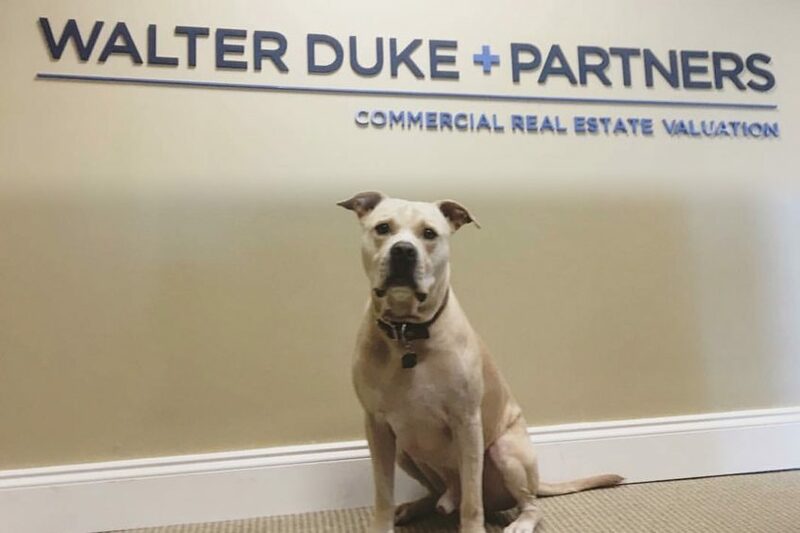 Walter Duke + Partners is a Fort Lauderdale based full service commercial real estate advisory firm founded in 1975. For a personal consultation contact Walter B. Duke, III, MAI, CCIM. 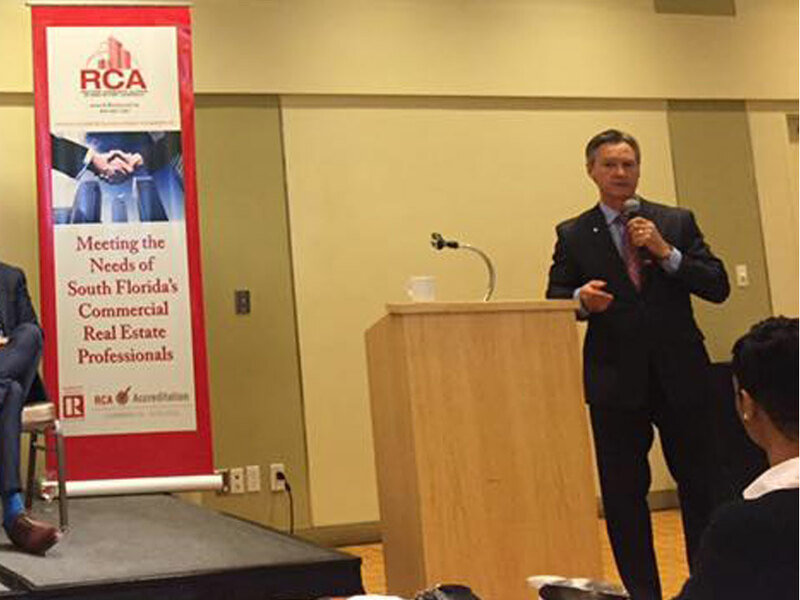 Yesterday I was privileged to moderate a panel of commercial real estate heavy hitters as they discussed their views on the commercial real estate market for Broward and Palm Beach Counties to a packed room of commercial real estate brokers and lenders. The power panel consisted of Bob Shapiro of Master Development, Jeff Greene of the Greene Companies, and Malcolm Butters of Butters Construction and Development. Collectively, these three have developed, owned, or invested in billions of dollars of commercial real estate in the Florida market. Construction costs are expected to plateau over the next 18 to 24 months which should bring some relief to skinny deals and increase feasibility. The main reason stated was the slowdown in the Miami vertical residential market where many large planned projects are being shelved. 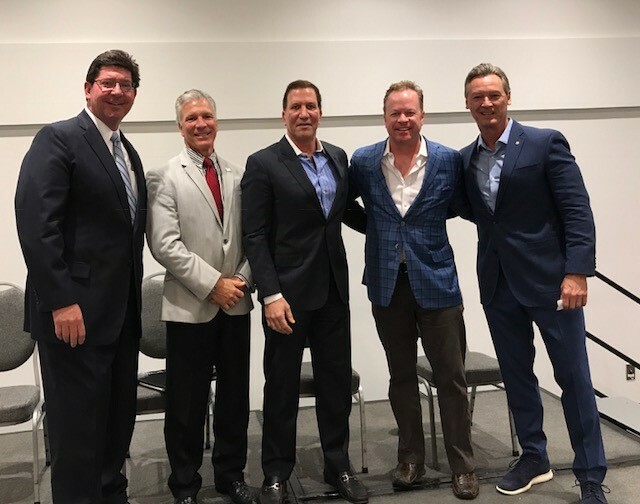 The consensus of the panel was that Broward is in the late middle innings of the current cycle, and that Palm Beach is the early middle innings. The current recovery started in Miami in 2011 and had since worked its way up the coast. Currently, Broward and Palm Beach are very active, and capital is flowing. Retail tenants are moving very cautiously, often in a pack mentality. Bob Shapiro, who is developing the 3 million square foot Dania Pointe, said that while retail leasing is good, the retailers are very interested and concerned what the other retailers are doing before they make a decision to pull the trigger on a lease commitment, thereby, slowing down the overall process. 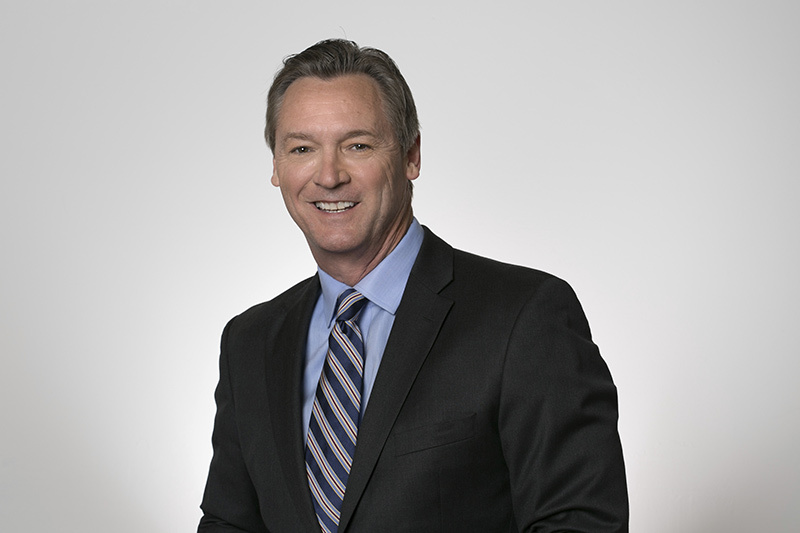 Malcolm Butters, whose company has developed over 18 million square feet, reports that he is very bullish in industrial moving forward, noting that it is the only property type that requires a larger site because it can’t be developed vertically. It may not be the sexiest product type, but it has the most stable long term prospects and most barriers to entry. E-commerce was cited as a driver as well. Give It Up for the Burbs! Even though Jeff Greene predicts massive job losses coming down the road, all the panelists agreed that suburban office might be a good investment because it is not feasible to construct new, so there will be no new competition for years. , due to its proximity to the airport and seaport, and its position along Interstate 95. All three panelists stated that it would take a lot to damage the currently robust South Florida commercial real estate market, but three potential headwinds include the outcome of the U.S. presidential election, an increase in interest rates, and the weight of the world recessionary conditions. Any of the three could wobble the markets and expose any weaknesses. All three panelists favored the passing of ballot initiatives in Broward and Palm Beach Counties concerning traffic and infrastructure but cited concerns over a lack of a plan for how the money will be spent. Jeff Greene noted that West Palm Beach CBD could probably only handle one new office tower and maybe one more hotel during this cycle, acknowledging a lack of market depth. Butters noted that Florida doesn’t enjoy the massive corporate relocations to the extent of a market like Atlanta. 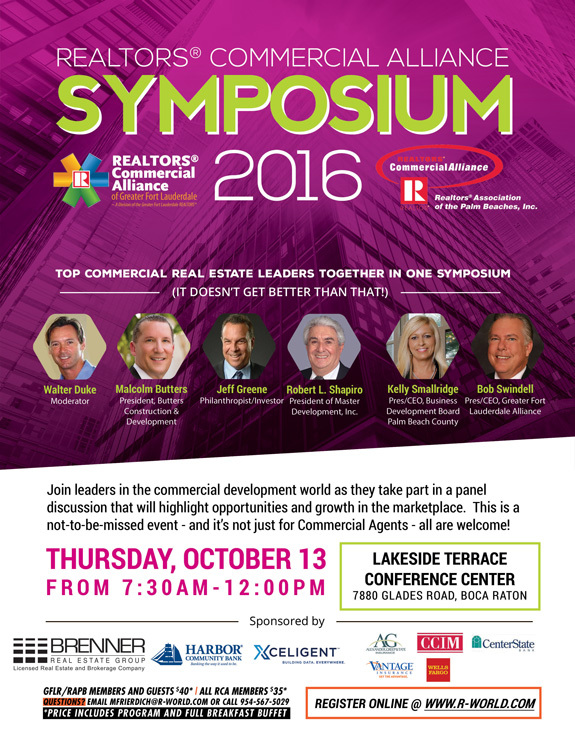 Top commercial real estate leaders together in one symposium. Join leaders in the commercial development world as they take part in a panel discussion that will highlight opportunities and growth in the marketplace. This is a not-to-be-missed event and it’s not just for Commercial Agents — all are welcome! Walter Duke + Partners enjoys a unique perspective having been through many real estate cycles in the Florida market over the past 40 years. One question I get asked a lot from many of our clients, is about the state of the Miami Condo Market. Below are some of my most recent observations. The Miami market is definitely plateauing due to growing over supply. Developers are shelving plans but there are still many more units to be delivered. We are also noting many more end-buyers putting their units on the market which will compete against current pre-sales. Fortunately, this is nothing new. Rising construction costs, increased competition, and a vastly devalued dollar against struggling South American economies, have served to tap the brakes on the Miami market for over a year now. Financial restrictions imposed by the Feds on the source of funds has hampered high-end sales. Up until that restriction was imposed, the affluent high-end projects were the market stars. This will impact Miami Beach, Miami, Surfside, Bal Harbour, Sunny Isles Beach, and Coconut Grove. Developers are circling the wagons to lure domestic buyers. Domestic buyers move much slower than foreign buyers. Sale paces will definitely trend slower. Many are also seeking to penetrate the Chinese buyer market which has been largely untapped. Some underwriters have started asking for 2009 value reference points to assess downside risks. We see smarter, more experienced developers pivoting to a “hold and land bank” position. One example is Terra Group in Coconut Grove. Rather than raze a 12-story Class C MF deal to build Phase II of Park Grove, they are rehabbing the building and going to operate it until the next cycle. Developers seeking to keep their momentum have shifted to rental product. However, this market is also getting crowded and equity is increasingly on the sideline letting their early deals cycle out while they wait out the presidential election. Some developers like Greystone are rolling out niche concepts, like Dadeland Overture, which caters to Active Adults in the 70 year old category and are priced above market rate projects, but below Independent Living product. There are much more services and common space in this Active Adult product. The construction cost is also about 25% more than typical luxury multi-family product. Much of the capital has fled north to Broward and Palm Beach seeking less expensive dirt and more affordable markets. Now markets like Fort Lauderdale are starting to get heated in the multi-family space. There has been a noticeable pullback from the big banks in the Miami condo market, except for the best developers, on the best sites, with the best product. Secondary lenders, such as Bank of the Ozarks, are now trolling the market in search of opportunities that produce greater yields along with the cycle risk. Private lenders and equity sources are now underwriting “loan to own” scenarios as developers that lack staying power struggle to hang on. Those who bought land in Miami after 2013 and don’t have their projects out of the ground by now are at the greatest risk of significant financial losses. Those whose projects are under construction and/or are “best in class” are the most insulated. I still don’t believe that we will see anything like the Great Recession, but there is growing evidence that the Miami market is entering into a hyper supply mode that will result in lower prices and financial losses. The upside is that maybe, finally, there will be more affordable opportunities for domestic buyers to afford urban residential product.